LANSING MODEL G, 28″ X 120″ OIL FIELD LATHE 9 1/4″ SPINDLE BORE W/ 2 23″ 4 JAW CHUCKS, TAPER ATTACHMENT, 8-500 RPM POLAMCO TUR630M LATHE 25″ X 120″ 5″ SPINDLE BORE 16″ 4 JAW CHUCK, 18-1400 RPM, 12” STEADY. 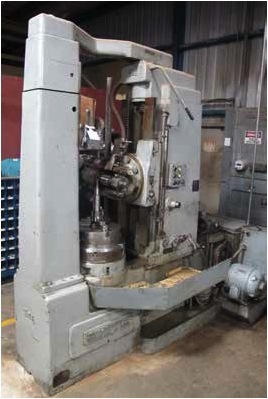 TARNOW TUJ-50 GAP LATHE 21″ X 120″ 4″ SPINDLE BORE, TAPER, 35-1800 RPM, 15” 4 JAW CHUCK. GOULD & EBERHARDT GEAR HOBBER 24H, 54 TOOTH GEAR, 10 SPROCKET SPLINE MACHINE, CHANGE WHEELS CINCINNATI NO.